For the caramel: Combine sugar and water in a small pot and cook on medium-high heat until the sugar melts and turns into a light golden caramel. Stir while it cooks so it doesn’t stick to the bottom and burn. Pour hot caramel into the small molds. For the flan: Preheat the oven to 350 °F. In a blender, add eggs, the two types of milk, pumpkin pure, cinnamon and clove. Process until everything is well combined. Pour the mixture into the flan molds. Place the individual molds on a baking tray and add a little bit of water (enough to cover half way up the side of the molds) and cook for 50 minutes in this water bath until the flans set. Let the flans cool and then refrigerate for 2 hours before serving. To remove flans from the molds, place them in a container with hot water for 1 minute before serving and this will help melt the caramel so the flans can be served. 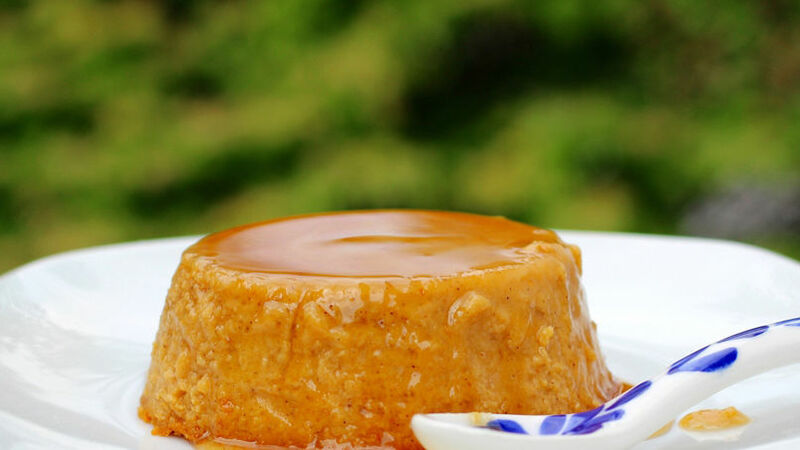 I love flan and I find it to be the perfect dessert to serve after your meals; it also makes a great snack for the kids. This pumpkin flan is made with eggs, evaporated milk, condensed milk and pumpkin puree, which adds a delicious flavor and texture. I’m sure you’ll want to add it to your list of flan recipes. Making flan is an easy process and not too time consuming. This time I’ve chosen to make it in small molds since they look more appetizing that way. And what’s best, they are individually portioned and can be served much easily.